I am sure you have found yourself in a situation where you have to search for a restaurant or a hotel in an area. In the last 3-4 years many sites have sprung up that take this burden of choosing from your shoulder. To find a great restaurant you can search its reviews on Yelp, or you can find an apartment on Airbnb with relative ease. But none of this is intuitive. When you are low on time, you do not want to type on your mobile, wait, and then sift through the results helplessly. What you want are results based on your previous experiences, your likes and dislikes. This is where Google search for hotel and restaurants comes in. With its help now you can directly ask your phone instead. Speak queries like “show me restaurants in New York”, and the search results page will return a list of restaurants. Google is no stranger to the travel market. Ever since it acquired ITA Travel, it has been slowly adding travel related products to its search functionality. There is no faster flight search engine on the market than Google Flights, for example, and its hotel search, which aggregates data from numerous sites, is also fast and highly competitive. However, very few people know about these features because Google does not really advertise these products. You should also note that Google has already integrated flight search data into its Voice search. 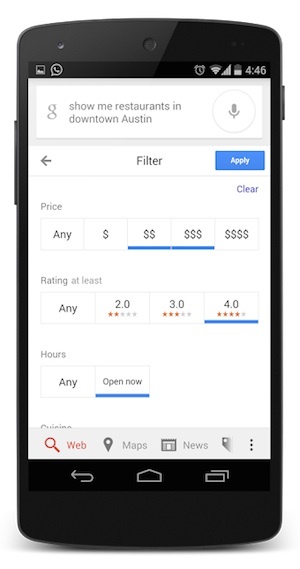 According to Google, these new additions will make it easier to search for last-minute bookings. The company is adding lots of products that use Voice search as their main medium of interaction lately. We can guess from this, that Google wants to pursue Voice search as the medium for future products as well. So, it makes sense for Google to continue to bring more of its products that use this mode of interaction and let users get familiar with it. Wonderful info, I think it would be really awesome if I can find nearby hotels. Though I was using maps for this purpose.